Easily select your favourite meals and order, add gift cards and send it to family and friends. This is new creative platform to order your favorite food in Canada. This food delivery website provides easy way to select your favorite meals and order in few minutes. This website has user friendly and rich features that allow you to explore a large list of meals and details. This website enlist four featured meals from to choose. With bunch of features, anyone can easily select meals, order and track their delivery status. We have developed this website with user-friendly experience and latest tools for development. 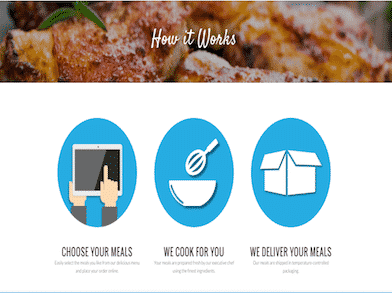 Fresh meals is responsive website and easily accessible via Web, Mobile and Desktop platform. User can access list of meals available on website. User can select meals and add to Cart. User can select meals from four major plans to order. User can checkout and order food. User can login and create account on the website. User can track order history and delivery status. User can edit account and payment information. User can purchase gift cards as well. User can explore meals recommendation as well. This project had to be developed with custom meals selection and shopping cart feature where user can adjust his requirements manually. We have successfully delivered this project with meal catalog, order booking and checkout function, order history and other rich featured functions. This website is fully responsive and developed using CMS tool and cloud database. This website has features like Meals Listing, Selection, Odering, Payment Transaction, Order Tracking and History and other related capabilities.